Boothbay Harbor is a wonderful day (or half-day) trip from Brewster House, and it is only about 45 minutes away! The drive is scenic, with plenty of lupine to view in the spring, and foliage in the fall. The road winds through farmland and villages, passing through the village of Boothbay, and on to Boothbay Harbor. Once there, you’ll find wonderful local shops with everything from tourist souvenirs to clothing to home decorating and even art galleries.Add to that charming restaurants, a lovely public park by the town dock, and a footbridge across the harbor, where you can walk to the Lobster Dock restaurant and view the town from the other side of the harbor. The harbor is filled with islands and boats – fishing boats, whale watching tours, and pleasure boats. It is a photographers’ dream! Especially at sunset (or sunrise!). Treat yourself to a delicious ice cream cone at one of Maine’s best ice cream parlors, before heading back. You may want to take a side trip to East Boothbay to admire the views, or to Southport Island and Newagen, where you can see a bit of the Maine coast, “up close and personal,” as they say. In Boothbay (about 2 miles from Boothbay Harbor) you can also stop at the Coastal Maine Botanical Gardens, where beautiful gardens are always in season! 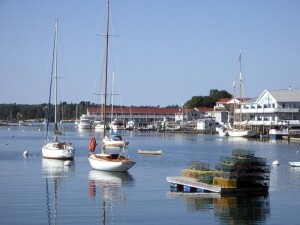 Boothbay Harbor is one of our favorite things to do near Freeport!